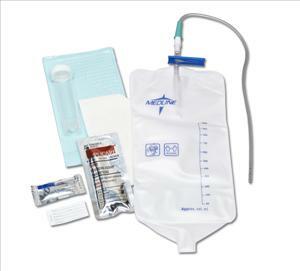 These sterile kits are ideal for self-catheterization training or for when disposal of urine is not readily available. Includes water-soluble lubricating jelly, 1000cc collection bag, moisture-proof underpad, fenestrated drape, and specimen container with ID label. All CSR wrapped. Also Contains: 14Fr Vinyl Catheter, 3-pk PVP swabsticks, Vinyl Gloves.